Located in the New York City, Columbia University has a long history of innovation and education in engineering (see Movie, the 150 years of history of SEAS and the history of computing at Columbia). 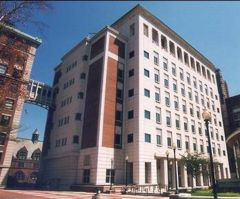 At the same time, Columbia has been one of the most dynamic engineering schools in the United States. We are rapidly growing for the last two decades, entering top-14 in US News & World Report. The EE department is recently ranked at the top-15 along with UCLA (13th-tie), USC (13th-tie), UCSD (15th-tie) and UMD (15th-tie). With the planned initiatives and expansions, we envision to further strengthen our programs. We often have openings for research and teaching assistantships for students interested in obtaining a Ph.D. degree with research in VLSI circuit and system design and methodology. Prior experience in electronic design (preferably including integrated circuit design) and good English skills are always plus. You can find the type of research projects we are currently engaged in on our research page. You may also want to check out our publication list to get to know more about our research topics. If you are self-driven, highly motivated candidates and like our research topics, you should apply online through the official site with chekcing my name as one of the faculty you would like to work with. We will carefully review your applications. If needed, email Prof. Seok. Please use 'prospective ph.d student application’ for the subject for filtering purposes. Also please include your CV and transcripts long with details on motivations, educations and prior research and design experiences. Our group has an active program of undergraduate and MS student research involvement during the semester and summer. If you are an Columbia Undergraduate, Master's, or Ph.D. student interested in doing a project (for credit) that involves designing, simulating, building and/or charaterizing VLSI circuits and systems, please don't hesitate to contact Prof. Seok. If you send emails, please include your CV and transcripts. We usually do not offer an internship position for the studetns from foreign schools. Email is the best way to contact. If you want to visit physically, we are located in the Shapiro Center (a.k.a CEPSR) in the Morningside Campus of Columbia University. Here are two links for helping your travel.